Washington's efforts at Wall Street reform and consumer protection keep having strange and unintended consequences for Main Street businesses and customers. 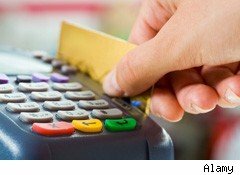 The Durbin Amendment, part of the Dodd-Frank Act, set a cap on the amount financial institutions can charge merchants to process debit card transactions. Previously, the average "interchange" fee was 44 to 45 cents per transaction. As of Oct. 1, the maximum swipe fee was cut to 21 cents. The intent was to keep the cost of doing business down, but that goal is reportedly being thwarted by the credit card companies' response. According to The Wall Street Journal, Visa (V) and Mastercard (MA) have eliminated the discounts they previously offered on interchange for small transactions -- those under roughly $10. Instead, the credit card companies now charge many small businesses the maximum 21-cent fee allowed by the law. As a result, small merchants face a conundrum: How to convince their customers to pay in cash, after several years of marketing designed to encourage debit card use? The problem is especially acute for those businesses that deal for the most part in sales under $10 dollars, like coffee shops. Alisa Morkides, owner of Brew Ha Ha!, a nine-store coffee chain in northern Delaware, recently had to raise prices in order to offset what she said was a 35% increase in interchange fees paid to big financial institutions. "We've been in business for 18 years and we just started taking credit cards in 2007 -- and I'm sorry I did," Morkides says. "When McDonald's started, I was told I had to do it. It did not increase our sales but now it's a weird bind." In her first year of taking credit cards, Morkides says interchange fees ran to $30,000; this year, she expects to pay $85,000. Roughly one-third of her customers pay with credit, an amount that has grown over time. "I pay half in health care what I pay in swipe fees," Morkides explains. "I don't pay this much in business insurance." Morkides experienced the impact of the card companies' response to the Durbin amendment right away: "In September, I was paying in interchange rates $2,914; in October, $4,677." The new rules on swipe fees took effect Oct. 1. "Our overall sales have been constant," she says of the rising costs. "It's all interchange." The Wall Street Journal reports that the amendment's namesake and champion, Sen. Richard Durbin (D-Ill.), "declined through a spokesman to comment on the consequences of the law." But higher costs due to swipe fees are not direct consequences of the law itself; rather, they result from the card companies' response to the law. This is not the financial industry's first attempt to avoid any loss to their own profit margins by raising costs for others: Big banks previously floated plans to charge consumers a monthly fee for debit cards, before a public backlash caused them to back down. The president of U.S. markets for MasterCard told The Wall Street Journal, "There will be some unhappy parties, as there always is when the government gets in the way of the free-market system." But this particular market is not quite as free as it might be: Visa and MasterCard each have a clause in their standard contract that prevents merchants from charging higher prices on credit and debit card transactions. As a result, merchants are unable to pass along swipe fees to their customers (or to decide not to, depending on their inclination). Since Visa and MasterCard have a near duopoly on the market, many merchants are trapped in unhappy arrangements like the one described by Morkides, with no choice but to raise prices across the board. - Additional reporting by Catherine New.